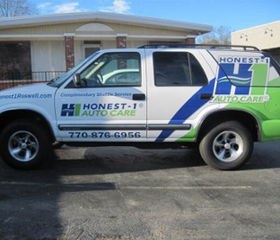 See & hear what Clients are saying about Apex Signs & Graphics!!! Alan Rosenbaum from Morton Plantation shares his experience working with Apex Signs & Graphics. The owners of M Chocolat in Alpharetta, GA share their experience working with Apex Signs and Graphics. Apex Signs & Graphics has done virtually all of the signs for my business since we opened in 2011. I have wall mounted exterior signs, a lighted monument sign, internal poster signs and have purchased several temporary vinyl signs as well. They also did the car wrap on my company truck. Dave and Jeff have always been a pleasure to work with! Dave came out to my shop several times to take pictures, get measurements and brainstorm various signage ideas. Jeff always comes up with a variety of options and mockups that are “photo shopped” onto my building so that I can get a pretty good idea of what the finished product was going to look like. I have never been disappointed in their service, responsiveness or prices. I would highly recommend Apex Signs & Graphics to anyone. I told Dave, but wanted to make sure that I also emailed you to tell you how wonderful the sandwich board sign looks! You are really great at interpreting people’s ideas. Thank you for completing the work and installing for us. It looks fabulous! Many folks have already given praise for the way the lobby panels look.